Excerpt from tribute to Hosmer McKoon on his death, published in June 1894 issue of the magazine Land of Sunshine. For the week of September 8, I wrote a post called “Raisins and Real Estate” which talked about efforts in the late 19th century to promote San Diego County. 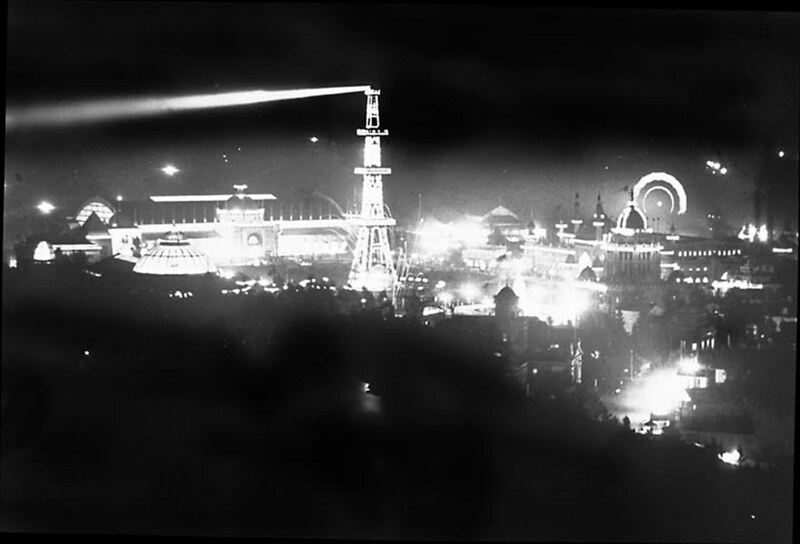 It described the county’s exhibit at the California Midwinter Exposition in San Francisco in 1894 which included displays of the county’s produce and distribution of free samples of raisins as an added incentive. 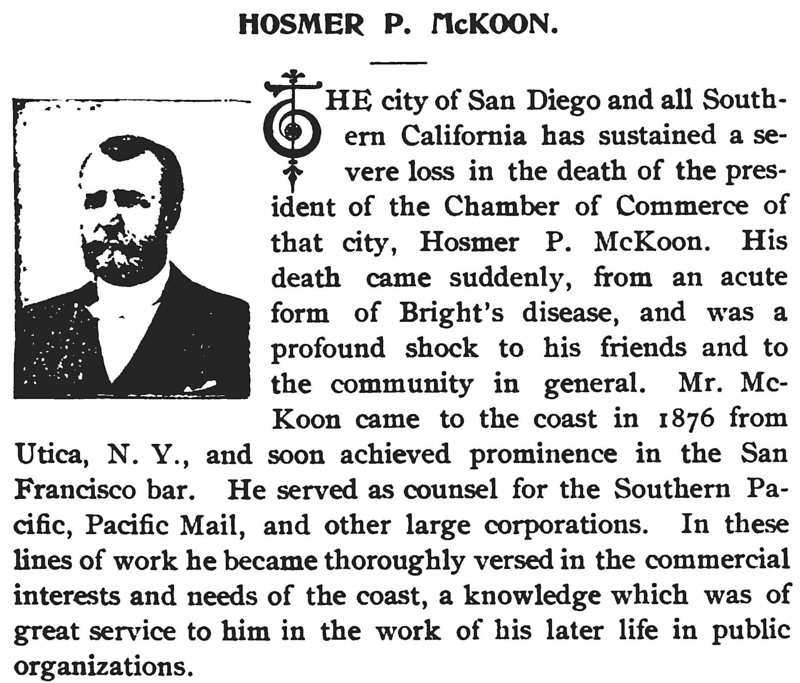 One of the movers behind San Diego’s exhibit was Hosmer P. McKoon. The San Diego Chamber of Commerce was a prime sponsor of San Diego’s exhibit and McKoon was chamber president. He was also elected president of the “County Commissioners Club,” an organization of representatives of the various exhibiting counties. Hosmer McKoon appears to have been a real go-getter, which is why he was chosen to lead various civic groups like the chamber and to represent the county at various conferences on development-related subjects in the late 1880s and early 1890s. McKoon was a practicing attorney, having earned a law degree in his home state of New York before moving to San Francisco in 1876, where his clients included the Southern Pacific Railroad. He must have done pretty well because when he moved to San Diego County in 1885 he was able to purchase 9,500 acres in the El Cajon Valley. He named his spread Fanita Ranch, in honor of his wife Fannie. She, also a college graduate and native of New York State, married Hosmer in 1873. Two sons, Hosmer, Jr., and Henry, were born to them while they were living in San Francisco, and came south with them in 1885. Hosmer led an active life, but a sadly short one. He died of Bright’s disease at the age of 49 in 1894. His widow Fannie recovered from her own illness and grief, raising her two sons and also taking over the business interests that her husband left behind, including property in the city of San Diego as well as Fanita Rancho. During the last years of her life she lived in the city of San Diego, where she died in 1917 at the age of 66. Author Carol Fitzpatrick will speak on “Meriwether Lewis- Debunking the Myths of His Suicide,” at the next meeting of the Temecula Valley Historical Society, Monday, September 22, 6 p.m. at the Little Temecula History Center. Free and open to the public. For details call Rebecca Farnbach at 951-699-5148. Rancho BEERnardo Festival at the Sikes Adobe Historic Farmstead, Saturday, September 27 from 3-6 p.m. Enjoy tastings choices from some of San Diego’s best craft breweries, live music food, and tours of the historic farmstead. 15 tastings for $30. Proceeds benefit local charities supported by the Rancho Bernardo Sunrise Rotary plus the Sikes Adobe Historic Farmstead. For further info visit http://ranchobeernardofestival.com/ . That was the headline on an article in the Poway Progress of November 30, 1895. That’s how the article began as well. “Stranded on the desert, within twenty miles of Banning, is where J. Chilson of Fallbrook, has found his son-in-law, Bud Russell, and family,” stated the article, which attributed the story to a Fallbrook newspaper. The Shipleys, Chilsons and Russells were all part of the same extended family, descended from Oliver Cook and his wife Clarissa. They were also somewhat used to traveling together, if their family history is any indication. 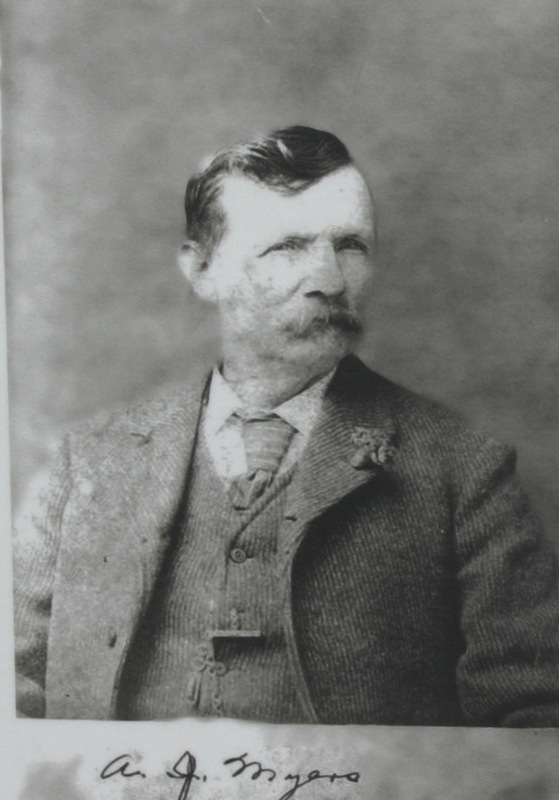 After over 20 years as a successful farmer in Kansas, Oliver Cook, then in his late sixties, decided to pull up stakes and move to California in 1885. With Kansas in a recession and train fares reduced due to railroad price wars, Cook convinced most of his extended family to come with him. Arriving on the same train that day at the Fallbrook depot were Oliver and his wife Clarissa, daughter Clarissa and husband Elmore Shipley and their two sons, and daughter Mary Elizabeth and husband Joseph Chilson and their three children. Oh yes, and one of the Chilson’s children, daughter Mary Alice, came with her husband, Allen “Bud” Russell, and two sons. The Russell branch of the family wasn’t quite finished with traveling, migrating to what is now Oklahoma in 1892. Although that didn’t work out too well, the Russells would re-establish themselves successfully in Fallbrook. You can find out more about this very enterprising—and mobile—clan in my book, Valleys of Dreams, available for sale through this website. Sources for this post included the archives of the Fallbrook Historical Society and the research of Susan M. Hillier Roe, third great-granddaughter of Oliver Cook. Art Animates Life and San Marcos Historical Society present a live train ride thriller, “Passage Into Fear,” September 19-21 at Heritage Park. A historical stage thriller in the tradition of Hitchcock and Christie, the play is set during World War I in recognition of the war’s 100th anniversary. Proceeds support the San Marco Historical Society’s educational programs at Heritage Park. Tickets $9 for adults, $5 for 15 and under. For tickets or further info call 760-716-0107 or visit www.smhistory.org .